A little while back I started trying to find out more about that adorable mysterious French singer Léonie Lousseau. This is an article from 25 January 1968 in the Nouvelliste du Rhône – you can see the full paper here if you wish. In the article our Léonie is presented as the “newcomer of the week” and she’s introduced by linking her in with the hot topic of the day: Bonnie & Clyde. Léonie, we are told, sports the Bonnie Parker look. Whatever, she looks cute. We’re also told that her press release describes her as being like a poem by Marcel Rioutord, which has been slightly misquoted. The original goes something like this: “You tell me that you love rain, but when it falls you close your window / You tell me that you like fish, but you cut off their heads / You tell me that you like flowers, but you cut off their stalks / So…when you tell me that you love me, I’m afraid!” Apparently, Léonie is like that! What else do we learn? Finally, we learn her real name: Martine Collet. Born 8 May 1947, half way between Rennes and Saint-Malo, 50 metres from a ruined castle once occupied by Bertrand du Guesclin’s soldiers. Daughter of a professor of literature; grand-daughter of a painter; she has two brothers. Léonie/Martine studied painting at Sèvres, before being a cover girl [just where are these pictures, I want to know?!]. She has blue eyes and freckles – she is 1m 62 (about 5 foot 4″) and weighs 46 kilos. The press release goes on to describe Léonie as “a marchioness who rings doorbells to make people press their noses against their windows”. My French is not fabulous and that’s very literal but there seems to be a sinister undertone to that about sizing up the competition or something. Anyway, it’s hardly important in the scheme of things considering it comes from a press release – although I wouldn’t mind a copy of that press release for my collection! The interesting thing is, in the SLC article referred to in part one of Who Are You, Leonie Lousseau? it says Léonie was born in 1950 rather than 1947. Knocking a few years off her age by the early 70’s…? Not sure why there was a need to do that and I’m not sure we’ll ever find out anything much about Léonie Lousseau. I’ll keep trying anyway and I hope readers find this of some small interest. The other thing I have found – and I’m not sure how accurate this information is – the release dates for a couple of singles: according to a French music database which I have somehow mislaid (I can’t find it now! 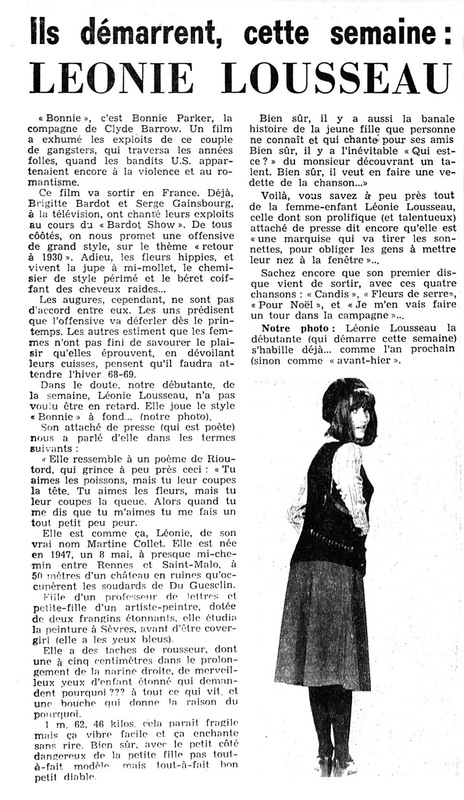 ), Léonie released En Alabama on 30 September 1971 and Le jardin anglais on 24 August 1972. That’s all the Léonie news I have for now but, hopefully, with my detective hat on, I shall come up with more information at some point. Usual applies – excuse translations, they’re all by me and I’m absolutely not fluent in French, so there!